International Journal of Research in Health Sciences,2013,1,3,134-139. Introduction and objective: Oil pulling (OP) is an ancient Ayurvedic procedure traditionally followed by the Indians for improvement of general health and oral hygiene. It is believed to be effective in treating many clinical problems including respiratory disorders. Its beneficiary effect on oral health had been well documented; but its impact on general health, especially on respiratory functions are scanty. Hence an attempt had been made to assess the impact of OP on pulmonary functions by recording peak expiratory flow rate (PEFR). Materials and Methods: 60 normal healthy students of both genders (30 each) in the age group of 17 to 24 years did OP for 15 minutes before breakfast using 10 ml of sesame oil. PEFR was measured before and after OP by using mini peak flow meter. 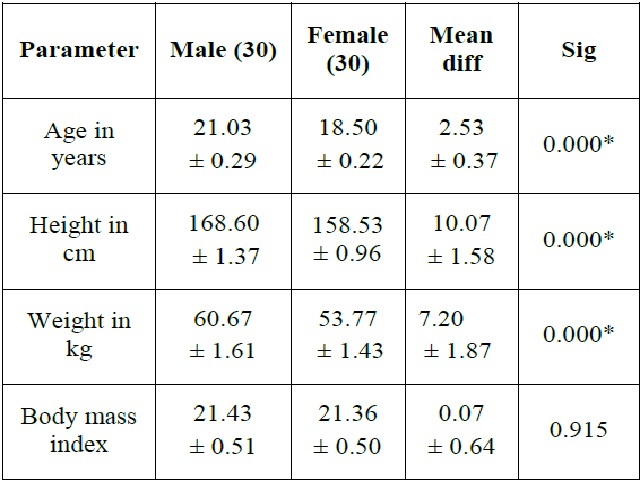 Results: Anthropometrically males had significantly higher values than females (p < 0.000). PEFR increased significantly (p < 0.000) after OP in both the groups (p < 0.000) and there was no significant difference in the level of increase (p < 0.915). DISCUSSION: Though PEFR is considered to be effort-dependent, it may not be the reason for its increase after OP in the present study because same effort was enforced before OP also. The most probable reason for increase in PEFR after OP in the present study may be the OP-induced bronchodilator effect. Conclusion: OP increases PEFR and as PEFR is a diagnostic and prognostic tool for respiratory diseases, OP-induced changes in PEFR may be of use in therapeutic interventions.